I may have been a bit to mysterious / technical in my previous post, so i'll try to explain what i found. In other words , having 50 skill in 2x tertiary endurance skills ( say blunt weapon & alchemy ) contributes the same to endurance as having 50 in 1x primary endurance skill like block . Having 50 skill in 2x secondary endurance skills (say athlettics & light armor ) contributes more to endurance than 50 in 1x primary endurance skill . This makes primary skills feel very undervalued and i think the calculation needs to be changed. I do like ncgdmw and the cap removal method used by greywander is ingenious but it does have issues that need correction. Quest rewards that change atttributes like the 2 strength increase from returning Cloudcleaver to Hlormar Wine-Sot don't work. I do hope greywander is subscribed to this thread. Just to inform that this mod has stopped working on the newest nightlies. As soon as you get out of the census office and click to select the levelling speed the game crashes to desktop. You should report that to Team. We are near to a new release and such regression would be very annoying. I did as you asked and reported the issue. EDIT: Disregard this, apparently has been fixed yesterday. I'm not sure why the screen shot didn't capture the rest of the message, but it says 'NCGD was expecting your base personality to be -5, but instead it was 0'. I've looked into the skill increase / attribute increase more, and now feel I had a wrong expectation of it. The terms ncgdmw uses for attribute growth is misleading. fast is close to vanilla morrowind leveling system and should probably be called normal. For standard and slow hard & very hard would be a lot more appropriate. I also tested the code change i posted in a bug report on nexus, https://www.nexusmods.com/morrowind/mods/44967/. It adjusts the stored values when ncgdmw sees the 2 strength increase from returning cloudcleaver and I didn't find any problems with it. If someone wants my edited version of ncgdmw, just let me know. Falc, I looked at ncgdmw code and think the error you got may be a symptom of a bigger problem. Afaics the number subtracted from starting attribute values is 25 , and that is only at initialization. With a normal start 30 is lowest possible starting value before ncgdmw kicks in. Even if all skills started at 0, no stored value should be lower then 5 . Damage and drain attribute effects should have no influence on those stored vars. Are you playing openmw or TES3MP ? Are you running a mod that allows alternative starts, changes racial bonuses or birthsigns ? please post your mod list. What quests had you finished when this occured ? What were your attribute values and how does unequipping everything change them ? For information this mod does not work with quick or alternative starts, at best you get the error Falc reported usually you die immediately. I rewrote most of this mod as I start with altered racial bonuses and birthsigns and radically reduced attributes and skills. Normally you have no start attribute over 25 and no skill over 15. I removed the code for choosing growth rates, you are stuck with what you call very hard. It takes about 3 days game time to see any increases and do not think about getting into a serious fight for a couple of weeks, even mud crabs are dangerous. But this is how I prefer to play. 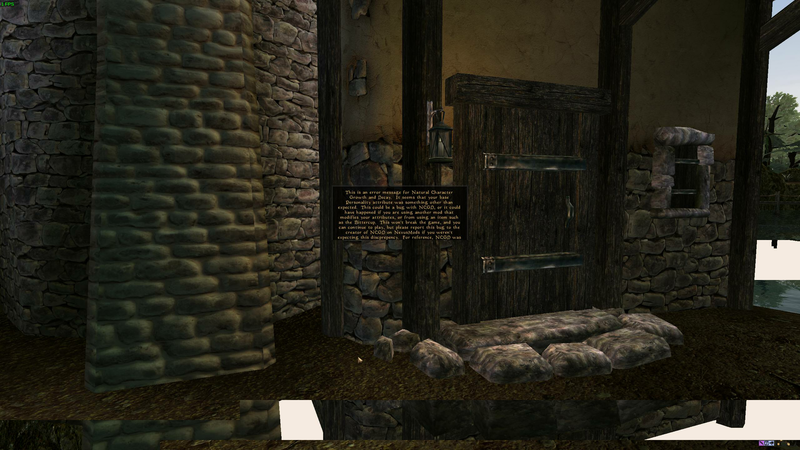 This occurs right at the start of the game when I leave the Census building, its in a normal game of OpenMW. I'm using BTB's character plugin which alters racial bonuses and birthsigns. I think this is probably causing the conflict, is this a serious issue or can I keep using both of them? I've looked into the BTB charater plugin and there are 2 potential conflicts with ncgdmw in it. ncgdmw doesn't use the morrowind leveling at all, but has it's own system to allow attributes to go over 100. BTB used fortify attributes / fortify skill spells for the boosters that should work fine with ncgdmw . All races except dark elves/ imperial / argonian have atleast one attribute value that starts at 20 .
ncgdmw subtracts 25 from all starting attributes so the attributes that start at 20 become -5 . I doubt very much openmw / morrrowind allow negative values for attributes and change them to 0 . Either BTB character plugin or ncgdmw need to change to prevent this. The simplest solution would probably be an edited version of btb character plugin with 25 instead fo 20 as lowest racial value. Doing it that way imo stays close to what BTB and greywander wanted to achieve with their plugins. All other ways this can be solved are a lot more intrusive. Hmm, I'm getting the bug to play some Morrowind again, let me just check the OpenMW foru- Oh. This thread. Has replies. In 2018. Um, I guess I probably shouldn't mention I've been sitting on an updated version that I never released with some improvements to the decay system. Okay, okay, put your torches and pitchforks down, I'm working on releasing a real update here. I didn't really realize how important this mod was, but I guess it really is the only Natural Grow mod that actually works with OpenMW (at the moment). So I'm working on addressing hopefully all of the compatibility issues that have been brought up in the thread so far, as well as fixing a major bug for those using decay. During initialization, attributes are now cut in half instead of subtracting 25. This should make the mod compatible with custom races that start with less than 25 in an attribute. This also reduces the effects of having very high or low vanilla attributes (so The Lady is less OP as a birthsign). When you see the error notifying you that an unexpected attribute value had been encountered, you now have the option to keep the unexpected value or revert to the expected value. This should allow things like the Bittercup to work, while still allowing you to revert things if they get screwed up. Due note that modAttribute can't usually raise an attribute above 100, so using the Bittercup while an attribute is over 100 will have no effect except to lower one of your other attributes. In version 2.x (possibly just the unreleased 2.2) skills actually wouldn't be able to decay below 150 if you raised a skill that high, and would stop decaying entirely if you raised the skill to 200. This had to do with the feature that wouldn't allow a skill to decay below half of the highest rank you'd reached with that skill, and has been fixed. First of all, the one outstanding incompatibility that's been brought up is that with Alternate Start mods and TEST3MP, and I hope to kill two birds with one stone. My initial thought was to create an alternate version of the mod that used a ring that, upon equipping, would start the ngcdMW scripts, rather than having them running as soon as chargen ends (which seems to be the problem with alt starts and MP). I'm still trying to figure out how to do this, or if there's possibly a better way. Actually, even as I type this, I think I have an idea to make this work, but it will have to wait for tomorrow. The other thing I'd like to do is create a rebalanced birthsign (and race?) mod designed specifically for ncgdMW (The Lady was OP, now less so since it's actually +12 instead of +25 due to halving instead of subtracting 25). I was browsing the wikis to see how Oblivion and Skyrim handled the same birthsigns, and I think I can work out something that will work and be relatively balanced. I was also thinking of merging my Better Regen mod in so that birthsigns can affect regen speed (the Apprentice and Lady standing stones increase regen speed in Skyrim, might be more appropriate than their current features). I'll probably make this an entirely separate mod, but would people prefer to have it merged into the main ncgdMW mod? I feel like making them separate gives people the freedom to choose, and some folks might prefer to use vanilla birthsigns and racials or use a different mod. I may or may not try and rebalance the races as well. I feel like Breton is OP in every TES game so far, and many races just aren't appealing unless you just really want to be Fargoth. I'll have to think about this in some more depth.